With hundreds of fantastic routes on three great crags in one beautiful area, the Osp region of southern Slovenia should be high on the list of venues for sun-seeking sportclimbers looking for interesting and high quality alternatives to Calpe and Majorca. Slovenia is a fascinating and beautiful country. It is here that the Alps enjoy their last spectacular flourish before dwindling into the flatlands of Hungary in the east. Much of the country’s modern history is shared with Austria as part of the great Austro-Hungarian empire, but when the first world war brought this to an end Slovenia became joined with the lands further south in what soon would become Yugoslavia. At the first opportunity after the fall of communism Slovenia asserted its independence as a nation. Immediately it used its close links with Austria and Italy to good advantage and quickly gained a national prosperity which now shares more in common with western Europe than with many of the other former Yugoslav states. The country seemingly defines itself by its mountains. Despite its tiny population of less than two million people, over 80,000 belong to one of over 200 local Alpine clubs, a proportion roughly forty times that in the UK. And out of this number have emerged many of the finest modern Alpinists of our age. But there’s more to Slovenia than mountains, and there’s more to Slovenian climbing than Alpinism. Those heading south from the impressive white-topped peaks of the Triglav National Park, towards the temperate Adriatic coast, will drive past the head of one particularly charming sleepy valley, and most will never suspect that just a few kilometres downstream lies a sportclimbing wonderland so perfect it almost could have been designed by mother nature specifically for the purpose of bolt-clipping fun. 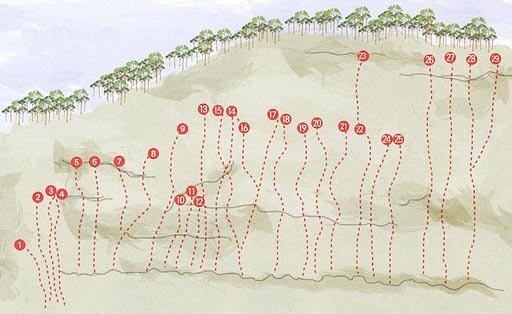 The three crags offer an astonishing variety of climbing in such a small area. In fact the biggest similarity is the time of year they are at their best. 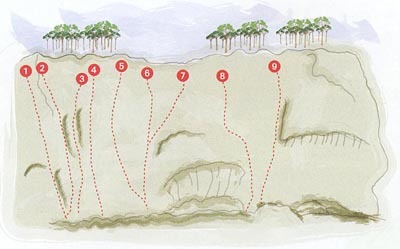 Since all the crags generally face south it can get oppressively hot in the summer months, and while it is likely that climbers on clear winter days will be in t-shirts the nights will be long and cold, and cloudy days most likely won’t be fun. Spring and autumn are best. In Mišja Peč particularly the options for finding sun or shade are considerable and a flexible approach to route choice will mean conditions can almost always be to your liking. 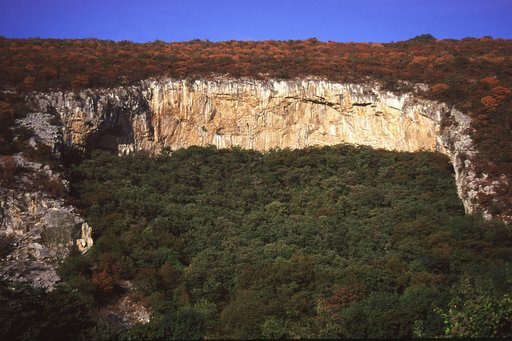 A natural escarpment overlooking the village of the same name, this extensive crag offers most to those operating at the more modest end of the difficulty spectrum. Its many buttresses are typically characterised by vertical walls of 15m or so, though many routes are considerably longer and features such as corners and cracks abound providing compelling natural lines. A combination of easy access, amenable routes and flat ground beneath the crag has led to Črni Kal becoming justifiably popular with families, though it’s usually not hard to find solitude on the less popular buttresses if you prefer. All routes are 22-30m, one of 13 sectors with routes mostly in the 4a-6b range. This sector in particular contains a superb concentration of high quality low to middle grade routes. All sectors can be reached within ten minutes from the road. This crag also takes its name from the local village and it’s not hard to see why, since the first climbs very nearly overhang some of the houses. But stroll just a tad further and the village becomes a perfect visual backdrop to your climbing day. If you have a mixed ability party this most certainly is the crag for you, as the upper crag in particular has many of the area’s best grade 6s alongside a healthy crop of superb 7s, almost all on wonderfully contoured white limestone and almost all bathed in glorious Adriatic sun. 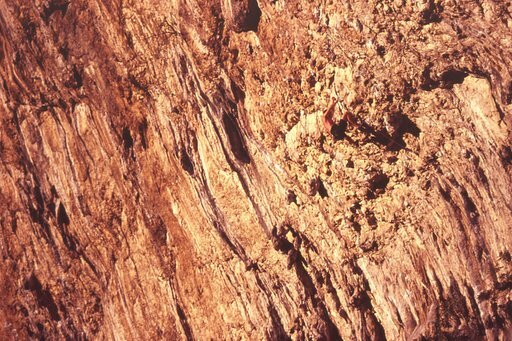 The other aspect to Osp cragging is very different again. The climbing on the big recessed wall is just as good and the grades are very similar, but here the pitches are stacked on top of each other to form multi-pitch adventures of the highest calibre. 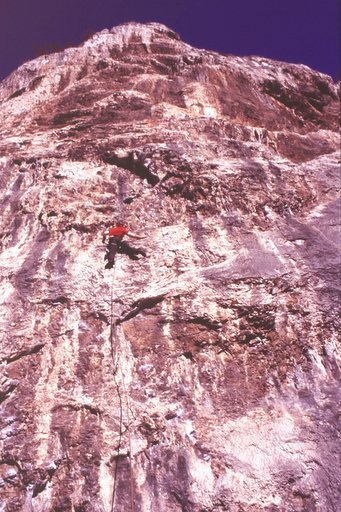 Many climbs are six or seven pitches long and most have at least one grade 7 pitch, so it’s not a wall to venture onto lightly. 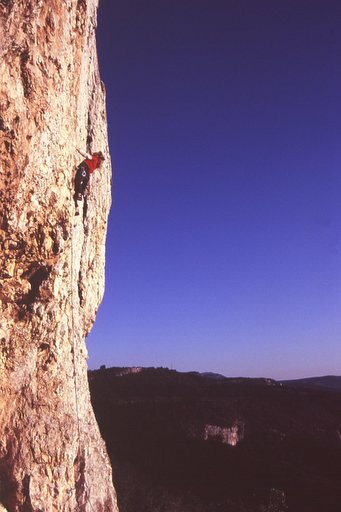 But there can be few places where such high quality multi-pitch sportclimbs are quite so accessible or quite so fine. The jewel in Slovenia’s hard sportclimbing crown, Mišja Peč has a huge amount to offer anyone able to cope with continually overhanging rock. Great routes start at about 7a but it really isn’t until you’re climbing 7c or so that you realise quite what a paradise this is. Line after line of bulging grooves and extended tufas compete for your attention, and often it isn’t until you’ve started up a route that the angle becomes alarmingly obvious and you realise quite what you’ve let yourself in for. Strength is obviously a prerequisite but without stamina it surely will be wasted on all but a few short lines. 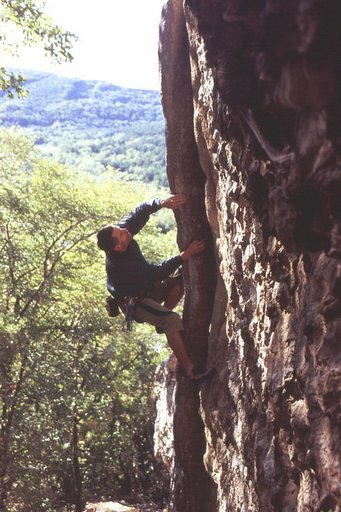 The crag rose to prominence in 1992 when one of the world’s first 8c+s was established here, but now even this has been surpassed. 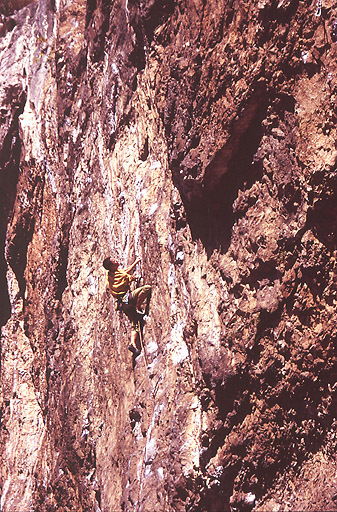 One of the crag’s most helpful and unique features is that at any time of day there are always climbs in the shade. Which means a flexible approach to route choice – maybe two projects on the go at once if you’re redpointing – can greatly help to keep the conditions just right. Mišja Peč contains a spectacular collection of predominantly middle to high grade climbing, with over 100 excellent and often charismatic climbs, without even considering a visit to the nearby Osp crag which offers many multi pitch bolted classics and some trad adventures. This in combination with Črni Kal ranks Osp in the top five European sportclimbing destinations. The most convenient and cheapest option is to fly with Ryanair to Trieste in Italy, from which Osp can easily be reached in an hour or so. Public transport options seem limited at best so a rental car is a must for anyone wanting an easy life. If Stansted isn’t easy for you to get to you may also consider flying with either easyJet or bmi to Venice. Then you’ll be able to use a few other UK airports, but you’ll have to add about two hours of Autostrada cruising onto your destination journey. There is no visa requirement for UK passport holders visiting Slovenia but the border stations are nevertheless fairly well patrolled. You shouldn’t expect any difficulties though, especially entering at Kosina, which is the shortest route and which is so close to Osp the border staff know about the climbing there! Once in Slovenia you need to turn right onto the old road towards Koper (don’t take the new toll road which will take you over the 1053m long Crni Kal viaduct and straight past the Osp valley, when the €20m project is finally completed next year). Immediately after a very obvious double bend a little road leads off rightwards down the valley into Osp village. There aren’t many places where camping is so clearly and obviously the best option but this is one of them. The campsite is impossible to miss in Osp, is run by climber-friendly people and populated almost exclusively by climbers from many nations. There’s a large room inside where you can cook and socialise away from any evening chill. You can buy cheap carafes of palatable wine, and the showers seem to have a plentiful supply of hot water. There are no shops in the village, but there’s a useful bread van which parks in the centre around mid-morning. note: For local access reasons climbers are now requested not to use the road shown above to access the Črni Kal parking from the main road. There is a suggested alternative approach from the North - please check the guidebook or ask at the Osp campsite for details. It is possible to find hotel or apartment accommodation in towns nearby but my memories of the time we tried this are of bleak rooms and high prices. It’s also best to cook your own food, though there are a few restaurants around if you drive a little way, and for a change of scene the roadside café-bar in the middle of the main road double bend is worth a visit for good value burgers and beer. The area is justifiably popular with climbers on road-trips, and there are usually a number of camper vans to be found in and around the campsite, full of keen climbers from all over Europe, which can make for a very sociable stay. The best guide is a beautiful book by Marko Prezelj which is simply called Slovenija and which covers all the country’s sportclimbing areas. It is published by Sidarta, there’s a new edition expected early in 2004 and it can usually be bought at the Osp campsite. An online topo for Mišja Peč only can be downloaded from http://ksp.pzs.si/images/miska.htm. This article, by John Arran, first appeared in the July 2004 issue of On The Edge magazine.